nikita wrote: Wow, seems like the Jackson's want to get rid of one of the only two La Ville Rouge fillies that they own. Never in a million years thought I would see one of Barbaro's sisters entered in a claiming race with a tag. Unless she has only three legs or two heads, they could probably sell her for much more than $25,000 at auction, if they don't want to add her to their broodmare band eventually. That is a bit unusual. Her last race was a Allow Opt- but not in for the tag- and she was second by a head. She is entered here as a MTO - with the tag- for Saturday- and it may come off the turf because of rain ( at least where I am- north of that). Perhaps they cant find another race for her? I wonder if they are scaling back their breeding. They've culled some mares lately. Valbenny (IRE) sold yesterday. Still, I can't imagine why they'd unload either of their LVR daughters just yet. 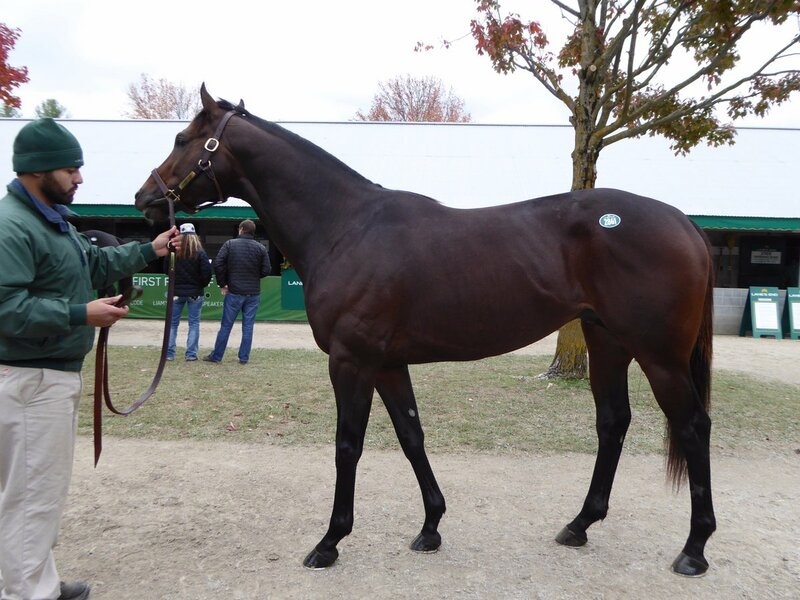 File this in the FWIW but not really Relevant Dept: a full sister to Giacomo (and therefore a half to a slew of nice horses) went for $9500 at Keeneland the other day. Even if she did have three legs or two heads the FOBs would want to snap her up real quick. There's going to be a dozen-way shake for her after this race. middleground, that mare you mentioned being 18 years old and not having produced any "big" horse probably contributed a lot to that low price. Geeze. Buy her for $25,000 + Get her covered by War Front + enter her at FTNOV18 + ????? = profit. I would expect she'll get scratched, even if the race comes off the turf. Among other things, she just raced (and came in second) the Friday before the BC, and they usually run them further apart than that. Actually- is he a 3/4 to Honor Code because of Indy? Is he small or is that just the perspective? Katewerk wrote: Is he small or is that just the perspective? The groom is standing in front of him and lower than he is. I hope that he does well in his new home. She's now listed as AE MTO and no longer runs for a tag. 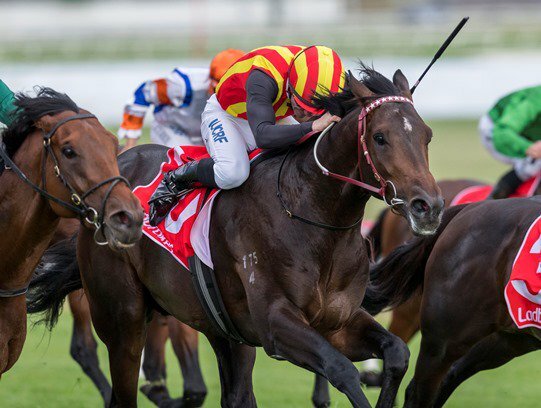 Peaceful State, a half-brother to Australian Horse of the Year Weekend Hussler by Animal Kingdom, was a smart second in the Sandown Guineas (AUS-II). Starine wrote: Peaceful State, a half-brother to Australian Horse of the Year Weekend Hussler by Animal Kingdom, was a smart second in the Sandown Guineas (AUS-II). Super performance by Animal Kingdom's son Peaceful State for 2nd, Sandown Guineas G2 at his 3rd start for Katsumi Yoshida & @DKWeirRacing. Fire Away--half to Mr. Speaker by War Front-- won the Artie Schiller at AQ today. His dam is a daughter of Unbridled-Personal Ensign. The Taj Mahal won a G2 in Australia today, making him the fifth GSW from five foals (all by Galileo) for You'resothrilling, a full sister to Giant’s Causeway. She has also produced G1 winners Gleneagles, Marvellous, and Happily. Gold Flag (JPN), (Stay Gold x Point Flag) - 2 yr old full brother to Gold Ship (JPN) - broke his maiden today at Kyoto going 2000m on the turf. He had an impressive last-to-first move about halfway through the race and then rated easily through the rest. Win the War looks like a filly to watch. She won the Glorious Song S at Woodbine today by 11 1/4 lengths. She is by War Front, out of SW City Sister. She's a 1/2 to GSW Dixie City. 2nd dam is Demi Soeur, who is 1/2 to Dehere. Believe in Royalty (Tapit/Believe You Can) easily won an opt. claimer today at Laurel. 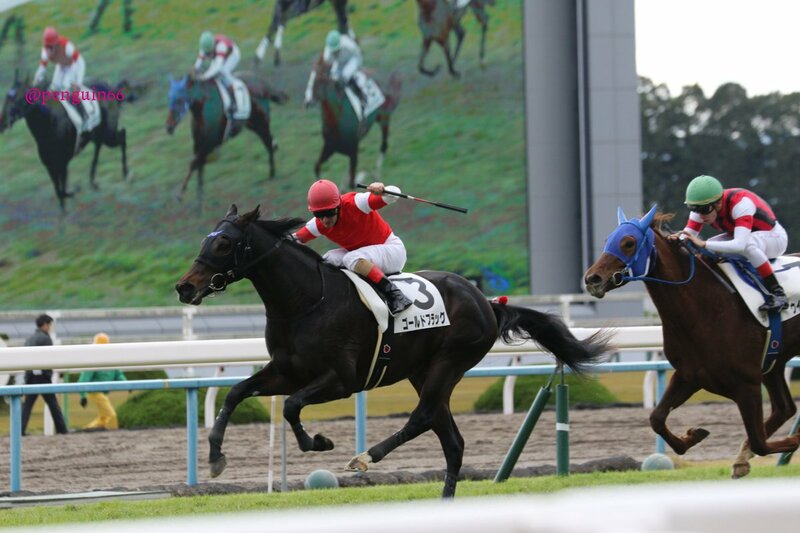 lurkey mclurker wrote: Gold Flag (JPN), (Stay Gold x Point Flag) - 2 yr old full brother to Gold Ship (JPN) - broke his maiden today at Kyoto going 2000m on the turf. He had an impressive last-to-first move about halfway through the race and then rated easily through the rest. I was thrilled with his move in the back-stretch. Just a heads-up if you decide to watch the replay - No War goes obviously wrong just before they round the turn for the home straight (not graphic, but still potentially upsetting) and the chart says he failed to finish.